THIS ITEM IS NOT AVAILABLE AT PRESENT. WE WILL NOT BE GETTING ANYMORE Star Wars Princess Leia Poptaters Mr. Potato Head. From the Star Wars collection by PPW Toys. 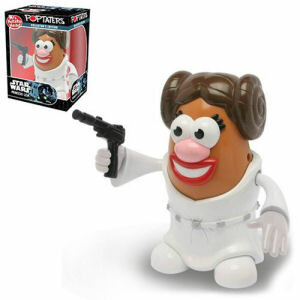 Star Wars Princess Leia Poptaters Mr. Potato Head. Mr. Potato Head figure that includes tons of extras and interchangeable parts. Measures approximately 6 inches tall. PPW Toys Star Wars Action Figures shipping from Canada. No Surprise Border fees or Customs!